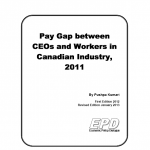 2012 survey covers how big pay gap between the CEOs and all other workers is in the Canadian industry as a whole and also in its different sectors. 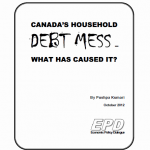 Canada’s Household Debt Mess – What has Caused It? 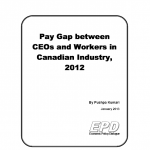 Study finds that several factors at macro and financial sector level are responsible for the debt mess. 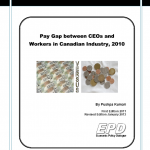 Debtors can be blamed for borrowing too much, however financial organizations are also responsible for lending that much, and above all the government and regulatory authorities, too, accountable for letting an excessive borrowing-lending happen in the economy. 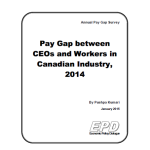 This year’s survey covers how big pay gap between the CEOs and all other workers is in the Canadian industry as a whole and also in its different sectors. 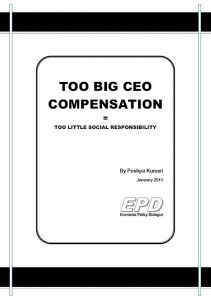 Study finds that it is not only the big amount of the CEO pays, but also the process and the impact, all reflect the socially irresponsible behavior on the part of CEOs.